Very orange ideas for arts & crafts, sensory bins, outdoor activities, and culinary discoveries. A picture game, activity sheets, a giant visual calendar, coloring pages, word flashcards, and many more orange-filled printables. 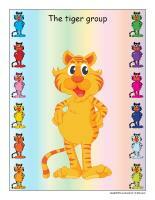 (Open thematic poster-Orange) Print, laminate, and decorate the walls of your daycare with all kinds of posters. (Open banner October) (Open banner October-small) Print and laminate. Use the banners to decorate your daycare. 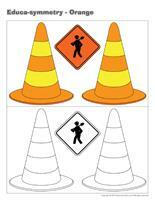 (Open educa-decorate-Orange) Print, cut out, and laminate. Decorate the walls of your daycare to set the mood for the theme. (Open garland-Orange) Print. Let children decorate the garland. Cut it out and hang it within your daycare or near your daycare entrance. (Open educ-poster-Orange) Print and display. We have created a giant visual calendar you can build throughout the month. You can use it to count how many days are left until Halloween or simply as a tool during circle time. (Open giant visual calendar-October) Display it in your circle time area and encourage children to take turns adding the dates. This special tool was created in response to a special request received. (Open group identification-Tigers) Print and display in a specific location or in your circle time area. The pictures may be used as a memory game or to spark a conversation with your group. Use them to decorate your daycare or a specific thematic corner. 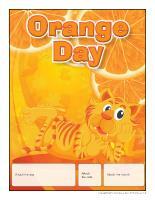 (Open picture game-Orange) Print, laminate, and store the pictures in a Ziploc bag or in your thematic bin. 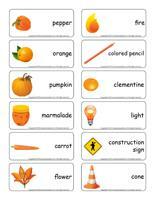 (Open activity sheets-Orange) Activity sheets are suggested for each theme. Print and follow instructions. 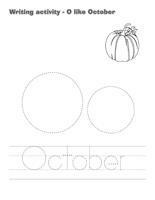 (Open writing activities-O like October) Print for each child or laminate for use with a dry-erase marker. 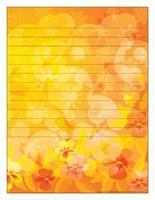 (Open stationery-Orange) Print. The stationery can be used to communicate with parents, in your writing area, or to identify your thematic bins. Different shades of orange felt can be added to children's constructions. Construction paper, tissue paper, etc. in different shades of orange for cutting, drawing, and creating. Orange markers with different tips (narrow, broad, etc.). Color by number activity sheets requiring the use of orange crayons. 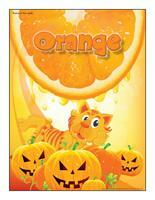 Association game involving colors (example: an orange card can be associated to a pumpkin). Orange cellophane paper can be cut and glued to the bottom of empty toilet paper rolls to make orange binoculars. Homemade Twister game involving orange items. 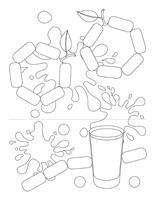 Water table: add drops of orange food coloring to the water. Rock bin: fill a container with tiny orange rocks (used in aquariums). (Open perpetual calendar-Orange Day) Print and display near your daycare entrance to inform parents and children of this special day. 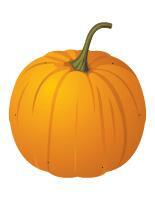 As children arrive, draw an orange item on their cheek such as a pumpkin or a flame. Offer children a glass of orange juice as they arrive. 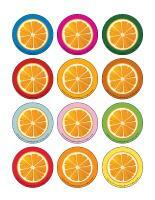 Arrange sliced citrus fruit on a plate (oranges, mandarins, clementines, tangerines, etc.) and deposit it on a table at snack time. Make an original orange hat by simply gluing orange items on a baseball cap or strip of paper. You can also make orange hats with your group or invite parents to make a special orange hat with their child. Display pictures of orange items on your walls and deposit some on the floor. Hang orange decorations from the ceiling. Offer as many orange toys as possible. For lunch, serve pumpkin stew or carrot soup. For your main course, make macaroni and cheese and serve carrots on the side. For dessert, prepare orange-flavoured pudding, carrot muffins, or orange sorbet. Add a few drops of orange food coloring to their glass of milk. Bake a cake and spread orange icing on top or make pumpkin muffins. Fill ice cream cones with orange sorbet. Hang a large banner on the wall. Invite children to make a collage by cutting orange items out of catalogues or flyers, tearing pieces of orange paper or cardboard, etc. Play a modified version of musical chairs. Simply replace chairs with orange shapes secured on the floor (or stick them directly on the chairs). Play music and invite children to dance while waving orange scarves (or pieces of orange fabric). (Open game-This is my spot-Orange) Print two copies. Laminate and cut out the cards. Glue one copy of each card on the table using adhesive paper. Drop the other copies in a bag. Children take turns picking a card to determine their spot at the table for the day. You may also use the cards to determine naptime spots or for your task train. (Open my orange path) Print, laminate, and secure the illustrations on the floor to create a path which leads to areas frequently visited by children such as the bathroom or cloakroom. If you prefer, the illustrations may also be used to delimit your various workshops. (Open lacing-Orange) Print, laminate, and punch holes around the contour of each shape. Give each child a shoelace or ribbon they can thread through the holes. Fill a large container with orange toys. Children take turns selecting a toy. Have them return it to the correct spot/shelf within the daycare. Visit your local hardware store and collect several orange paint chips. Be sure to have two copies of each color. Cut the paint chips that contain more than one shade of orange. Hide one series of paint chips throughout the daycare. Divide the second set of paint chips among the children in your group and invite them to find the matching cards. Hide orange objects throughout the yard. Invite children to hunt for them. Make this activity even more fun by hiding very tiny items and providing magnifying glasses. Variation: This activity may also be done indoors or even in the dark with flashlights. 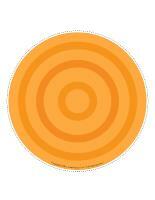 Go for a walk with your group in your neighbourhood and search for orange items. 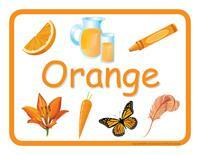 Make a list of all the orange things you see (or take pictures) and discuss your findings during lunch time. (Open educ-trace-Orange) Print for each child. 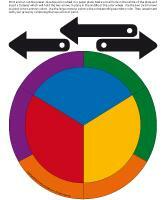 Children must trace the lines using the correct color and then color each item using the corresponding color. (Open educ-colors-Orange) Print for each child. Children must color only the items that are normally orange. (Open educa-symmetry-Orange) Print. Children must color the bottom picture (black & white) to make it identical to the top picture (in color). Deposit several orange objects on a table. Have children observe them closely. After a few minutes, hide the items with a blanket. While the objects are hidden, remove an item. Remove the blanket and ask children to identify the missing item. Give each child a picture book. When you give them the signal, they must turn the pages to find orange items. Each time they see an orange item, they must say "orange" and show the other children what they found. Cut a variety of shapes out of orange construction paper and secure them on the floor throughout your daycare (or yard). Play calm music and invite children to move to the sound of the music. When the music stops, they must quickly find an orange shape to stand on. Where does orange come from? Using poster paint, ask children to try to create orange paint by mixing different colors. Once they have had the chance to try a few combinations, tell children about primary and secondary colors. Give each child a small quantity of various paint colors. Let them experiment. Add a few drops of orange food coloring to the water in each section of an ice cube tray. Set it in the freezer. You may also choose to insert a tiny orange object in each section. Deposit a plastic container on a large towel, drop the ice cubes in the container and let children manipulate them. 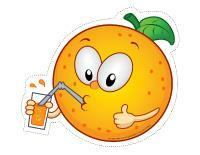 With your group, prepare one or two recipes with orange juice such as a smoothie or a cake. 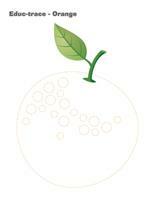 Organize a citrus fruit tasting activity. Have children taste oranges, mandarins, tangerines, clementines, etc. Together, identify differences and similarities. (Open puppets-Orange) Print the models on heavy cardboard. Have children cut them out and decorate them. Glue a Popsicle stick behind each model to create puppets. (Open models-Orange) Print the models and use them for various crafts and projects throughout the theme. 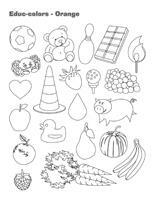 (Open coloring pages theme-Orange) Print for each child. 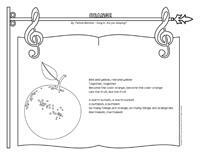 (Open songs & rhymes-Orange) Print.